What better time to do a makeover than at the beginning of a bright shiny new year? I’ve wanted to overhaul my website for a while, but finding time to do it was the issue. Not that the Christmas holidays are exactly overflowing with spare time (as if! ), but I had two weeks off from the day job so I only had the writing job to contend with and our editor, bless his heart, hasn’t gotten our manuscript for LONE WOLF back with his comments yet. And while we’re already starting to think about book 2 in the series, we haven’t actually jumped in yet. So in the week between Christmas and New Year’s Day, I spent a lot of time upgrading my Squarespace 5 site and to the current Squarespace 7 platform. Why take all the time to move to a new site? It’s true the new version 7 templates are really nice and clean, but the real reason for me is the fact that in this day and age, when visitors are as likely to read on a phone or tablet as a 15” laptop or a 24” flat panel screen, the new version is completely mobile responsive, so no matter what screen size and dimension, it will instantaneously respond and resize for the best viewing experience for both text and pictures. Also, this year will mark the launch of the FBI K-9 Mysteries written under our pseudonym of Sara Driscoll, and I wanted to have a fresh landing location for our new readers. The main site remains jenjdanna.com (though jendanna.com will also get you there), while saradriscollauthor.com will take you directly to the expanding materials around the FBI K-9 books inside the site. So it seemed like a great time to make the leap to a new and improved site. Many, many thanks to the crack support team at Squarespace (including Anthony, Ariela, Jordan, Erin, Thomas, and Kate) for going above and beyond to make sure that my import and redesign went absolutely smoothly. Honestly, folks, if you are looking for great web hosting with amazing support, this is the team for you. Welcome to 2016 and to the new Skeleton Keys! We were thrilled to find out yesterday that Skeleton Keys was named by ITSGOV as one of the top forensics blogs on the Web. 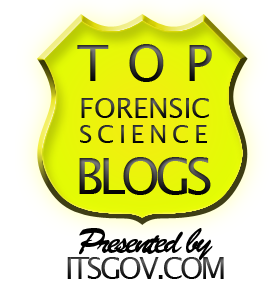 ITSGOV is a comprehensive crime scene investigation resource, and they have compiled a list of the top blogs that cover forensic science in its many forms. From the point of view of anyone who writes mystery or crime fiction, it’s a terrific resource on multiple levels. On behalf of myself and Ann, the partner behind the writer here on the blog as well as in our fiction writing, thank you to ITSGOV for including us!